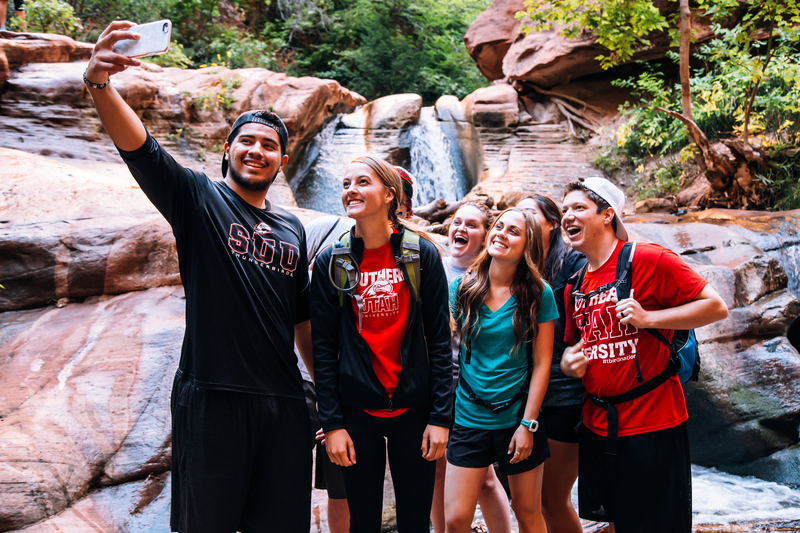 CEDAR CITY — Social media analytics company Rival IQ has ranked Southern Utah University in the top 10 in social media engagement for the 2017-2018 school year among more than 300 Division I institutions across the country. SUU’s Twitter account placed fifth in the nation, a significant feat when compared to the other larger ranked schools like Brigham Young University and Troy University. “Higher education is already the best performing industry on social media, so to have SUU considered the ‘best of the best’ is a huge testament to not only our marketing team who help create content for our platforms, but also to our dedicated T-Birds who like, comment and share what we post,” Lexi Carter, SUU’s digital marketing coordinator, said in a press release. SUU ranked among the top 10 schools overall across Facebook, Instagram and Twitter for consistently high performance on each channel. This year, SUU ranked eighth in the category ‘steadily engaging’ for remaining in the Top 50 overall since 2016. During the 2017-2018 school year, SUU’s Twitter account grew by 20 percent, Instagram grew by 18 percent and Facebook by 7 percent. Every week, SUU’s marketing communication team strategizes about content and distribution methods and tailors each post to reach specific audiences defined by the uniqueness of each platform, according to the press release. For example, Facebook content is created and shared specifically for community members, alumni, parents of students and SUU employees. The demographics for SUU’s Facebook followers trends to be older adults. On SUU’s Instagram account, though, photos are curated specifically for current and prospective students, keeping certain trends in photography and captions in mind. The SUU brand is easy to see on Instagram with campus photos, SUU logos and the official SUU color red showcased in almost every post. Positive rankings aren’t the only thing driving SUU’s social strategy. While “vanity metrics” are useful to prove necessity, the marketing team also sets goals based on controllable factors like content type, color/imagery, posting consistency and messaging. SUU as a whole is growing. For the past four years, the university has seen consistently steady growth increasing the student population by 34 percent from 2014. This year, SUU welcomed the largest number of incoming students to campus with 2,131 new first-time undergraduate students, a 9.4 percent increase over last year. While enrollment numbers continue to grow, so does the academic quality of these students. The incoming class had an average grade point average of 3.52, making them the most prepared freshman class in SUU’s history. The university is also retaining students at a very high rate and has the second highest retention rate for public schools in Utah. 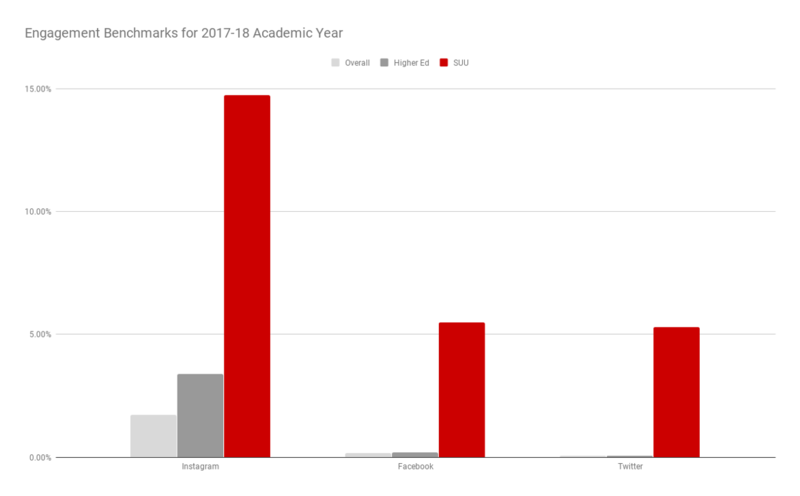 Rival IQ’s analytics software sorted through data from 338 Division 1 institutions, analyzing university-level account posts from June 2017- May 2018. Engagement is defined as a measurable interaction on social media posts, including likes, comments, retweets, shares and reactions. Overall rankings are weighted based on audience, activity and engagement.